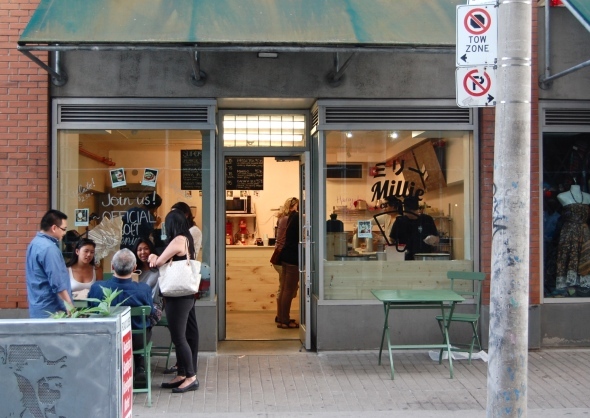 Millie Creperie has recently opened in Kensington Market. As is explained to us early in our visit, the difference between Japanese and French crepes is a combination of preparation and presentation. Japanese crepes, or at least the ones at Millie Creperie, are a little sweeter and a little crispier with raw as opposed to cooked fillings. They're also massive. The Japanese Special ($6.75) is Millie's signature dish. It's green tea gelato wrapped up in a crepe cone and adorned with strawberries and homemade (so to speak) whipped cream, flavoured with azuki bean paste and a matcha (green tea) sauce. The gelato is good, and the green tea flavour intense, and on the whole it's a rich but intricate combination that works thanks to the strong crepe-gelato pairing. 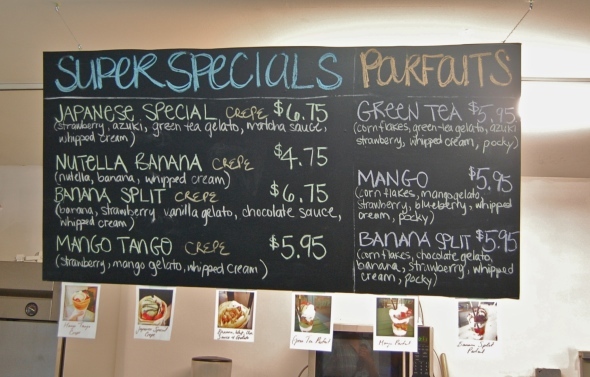 Even better is the Nutella Banana crepe ($4.75). Not as complicated as the Special - it sticks to the two main ingredients plus more frothy whipped cream - the novel presentation and the high quality of the ingredients result in an instant winner. After all it's not without good reason that chocolate and banana crepes are an all-time classic. At $4.75 it's also an absolute steal. As part of the restaurant's soft launch the menu leans more towards the sweet at the moment, with the savoury gradually being rolled out. 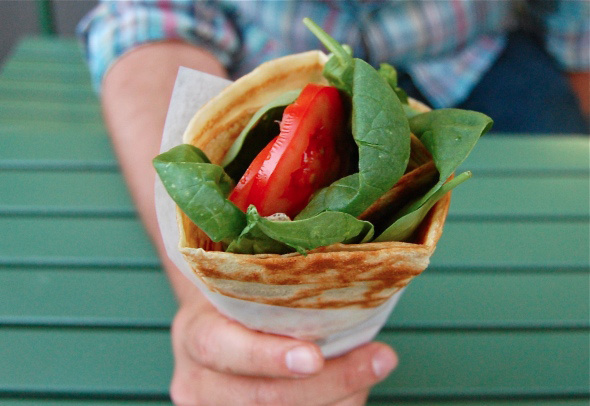 The Rabbit Food ($4.50, lead photo), a tomato and spinach ice cream cone (note: no actual ice cream), is one of the two options currently available, and comes with or without both spicy mayo and a thin layer of egg wrapped within the crepe cone. Based on our experience both are recommended. The egg adds a little more body to what is an otherwise lighter dish, while the spicy mayo, enthusiastically endorsed by our server (and with good reason), brings the whole dish together. Several parfaits are also on the menu, made to order. They come layered with whipped cream, corn flakes, strawberries, and the in-house made gelato, topped with a couple of pocky sticks. 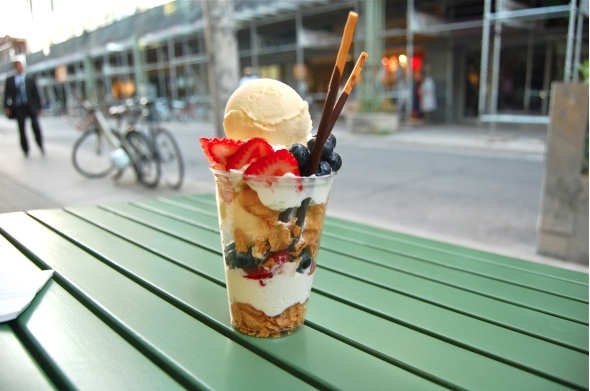 The Mango Parfait ($5.95) naturally contains mango gelato, along with blueberries to boot. The parfaits are more than serviceable, as the fresh ingredients and attention to detail present in all the other menu items show up here here as well. It's just unclear to me why anyone would prefer a good parfait over a fantastic crepe! Perhaps most promisingly, Millie's is continuing to experiment despite being open less than a week at the time of our visit. We're told by our friendly server that a test run of a smoked salmon crepes went over very well (not hard to believe), and that a Mille Crepe, a series of crepes spread with a thin layer of jam, nutella or other spread, then stacked on top of each other to form a multi-layered cake, based on the signature dish at Lady Mendl's in New York, will make an appearance on the menu at some point in the future. 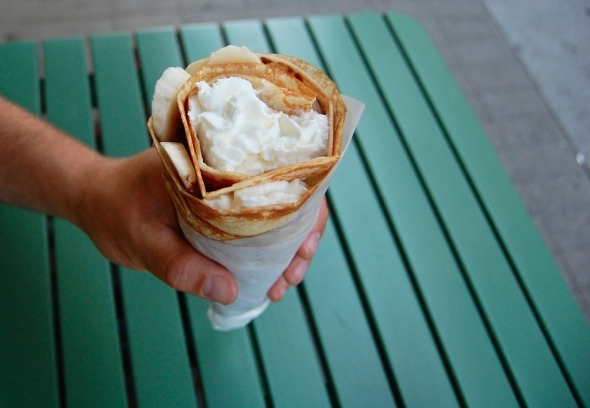 It all augurs well for what is already a very good, and very reasonably priced, creperie.